Molly McAdams has done it again! I recently read Taking Chances and loved it, so I had high expectations for this as well. I was not disappointed. From Ashes is the beautiful tale of Cassidy, a young woman who has been mistreated nearly her entire life by the people who are supposed to shelter you from the world - her mother and stepfather. After dealing with the death of her father, her knight in shining armor, on what should be the happiest day of a child's life each year, her wonderful life is shattered around her just like the glass shards of the mugs her mother would send flying her way. At least she has Tyler, her neighbor and best friend, who has tended her every need, bandaged every wound, and wrapped her safely in his loving arms for over a decade. But, nearing her eighteenth birthday, Tyler rips her out of her nightmarish existence in sunny California and moves her to down-home Texas. Enter Gage. Handsome, southern gentleman, Gage and it's love at first site... or is it? Could Gage really be in her life? But, what about Tyler, who has lived for her almost his entire life? 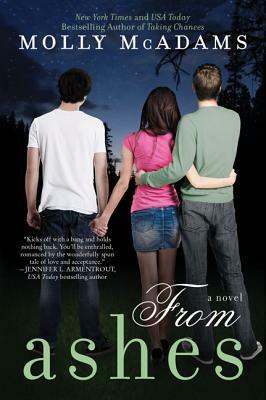 McAdams weaves this story through the views of both Cassidy and Gage. We get to see things through one and sometimes then review it through the eyes of the other, as well as just pushing onward through the main story from one character to another. It is never jarring and I love being able to see the story through both the characters' eyes. It draws it out just that little bit more. The main characters seemed like real people to me, but I will say that some supporting characters fell a little bit flat. More or less, the friends of Cassidy, Tyler, and Gage were there, drove the story, but at times, I wished I had just a little bit more to go on. Occasionally, I got confused on which friend was which. With that said, it honestly didn't detract from the story, but was simply worth mentioning. The members of the family were perfection. They were developed enough without overpowering the story. Gage's father was my favorite supporting character. Descriptions were fantastic as far as character, mood/feeling, and thoughts go, but I was fuzzy on atmosphere and setting and it took my own brainpower to fill in the gaps. As a person who thrives on amazingly descriptive writing, I had partially wished that there was more in that aspect, but on the other hand, it gave me the freedom to see the ranch, apartments, and other areas the characters visited as I wanted to see them without constraint. From Ashes was a great book to snuggle up with and I'm sure that most will enjoy this young love as much as I did.